Sify Technologies Limited has partnered with Ciena to upgrade network capacity from 100G to 400G. Sify will use Ciena’s converged packet optical solutions to handle increasing data volumes and provide support for IoT, cloud based services and Big Data analytics. Taking the Digital India mission a step forward, Maharashtra’s district Sindhudurg will have 184 more mobile towers and broadband in all panchayats. At present, 188 2G and 68 3G mobile towers are working in various talukas of the district. 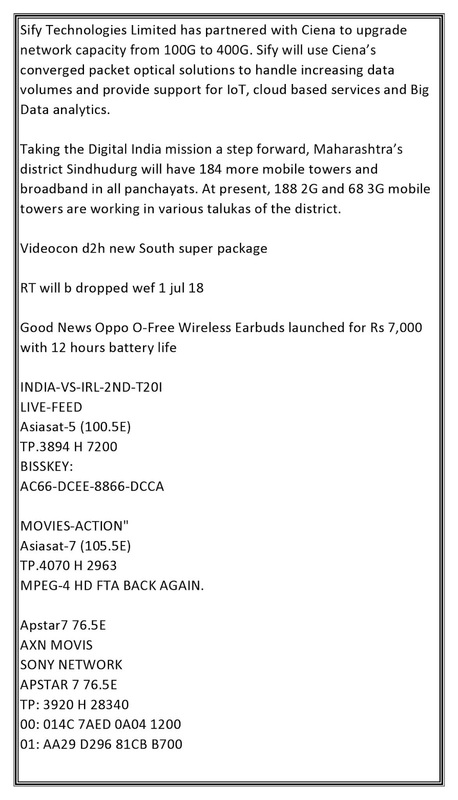 MPEG-4 HD FTA BACK AGAIN.